We find ourselves surrounded by objects, such as home appliances and vehicles, that communicate with each other through sensors, electronics and software that allow them to connect, exchange data and interact. These objects make up the Internet of Things (IoT), which extends Internet connectivity beyond the devices, that we generally associate with connecting to the internet, like laptops, tablets and smartphones. Previously ordinary and everyday physical objects and devices are equipped with modern technology, that enables them to connect to the Internet to interact and communicate with other devices, so they can be remotely monitored and controlled. The Internet of Things provides us with a growing number of devices that are aimed at making our personal life more manageable. At the same time, there are numerous applications in health care, manufacturing, infrastructure and many other fields of human activity. Smart devices and appliance for home-use can automate many aspects of our homes, including home security, media, lighting, heating and air-conditioning. 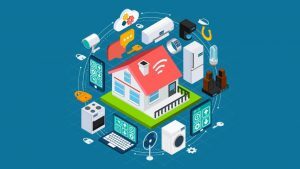 Often the IoT enables these devices to be remotely monitored and controlled by the home-owners smartphone, for example, it may be possible to see who is ringing the doorbell and open the door using an app on the smartphone. Similarly, users may be able to turn on the heating or air conditioning on their way home from work via the app. When on holiday, lights can be turned on and off remotely to give the impression that someone is home. A long term benefit of such a Smart Home is energy savings, by automatically turning off lights, heating and other devices when they are not needed. In Smart Healthcare the IoT is applied for medical and health purposes. IoT-devices are used for example to monitor heart rate, blood pressure, pacemakers, hearing aids and other specialised implants. The data from these monitors can be remotely accessed and in some instances they trigger the notification of emergency services.